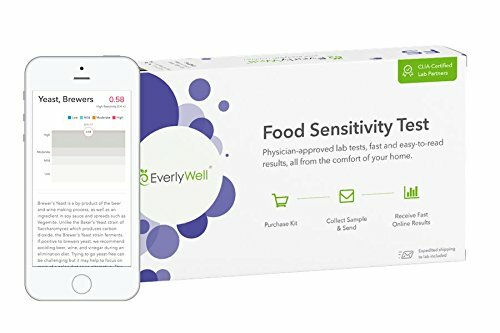 For a while now my husband and I have been talking about doing a food sensitivity test. While I've never had any real big issues with food, I definitely have become more aware of how I feel after eating certain things. When I did Whole30 almost 2 years ago the big things that I could actually feel making me heavier and more lethargic after adding back in were legumes and dairy. That's not to say that I now avoid them 100% of the time or that I have a sensitivity but I could tell I felt better when I didn't consume them. For my husband, he often gets a case of the sniffles after eating and the only things we can think it might be are dairy and/or gluten. Hence why we have wanted to try a sensitivity test! So when the folks at EverlyWell reached out to see if we would be interested in taking a test and reviewing it online I jumped at the chance. The test itself is very easy and straightforward, although being the antsy person I am I sort of rushed through the directions and we may have botched it a tiny bit. I happened to capture it all on video and shared it on my Instagram Stories which you should check out for a good giggle. That said, we did the test and about a week and a half later got the results in the mail! We shared the results also on my Instagram and can't wait for you to check it out, I was SOOOO surprised with what mine said (his too!!! ).